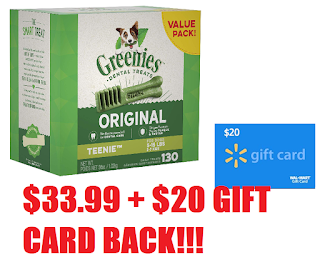 36oz Greenies Original Teenie Size Dental Dog Treats $33.99 + $20 Walmart Gift Card Back = Like Only $13.99, AMAZING PRICE!!! + Free Shipping Never been this cheap before after factoring that $20 gift card back. This one will end quick so stock up fast!